Scientists at the University of California have implanted electrodes into different spots in a giant flower beetle’s brain. Those electrodes are wired to a microcontroller and wireless radio which receives commands from a laptop. By sending electric impulses to the beetle’s optic lobes and flight muscles the scientists are able to directly control the beetle’s flight. Pulses of varying frequency, amplitude, and duration have different effects on the beetle’s motor activity. Instead of trying to redesign a system that can maintain flight from scratch, these scientists are piggybacking on millions of ears of evolutionary progress in the natural world. A cyborg in the most literal sense. Technologyreview.com has an article that explains all of this much better than I can. What’s most impressive, though, is the video. Be sure to take a look at it. There seems to be two reactions to this news, wonder and nervousness. Personally, I rank myself in the ‘wonder’ category. The story popped up as a Twitter post from Ed Stafford (@pixel8r) right as I was hitting the meat of the book How the Mind Works (which I wrote about briefly earlier). The mechanical processes that go on inside our nerual systems are extremely fascinating, and it’s exciting to see progress in the field. I think the nervousness (or straight up fear) from most people comes from a couple areas: the concepts of sentience and conciousness in organisms (with the concepts of suffering in the beetle), and the fact that the research was funded by the Department of Defense. For sure, these aren’t issues to be made light of, and there’s some very interesting discussion going on in the comments of this Hack a Day post about the story. I for one would like to welcome our new robotic beetle overlords. Digg’s official Google Gadget has been broken for the last day or so, but now it’s back with a new layout, and much more functionality. It has tabs for different categories, and now includes the thumbnails that are submitted with story submissions. 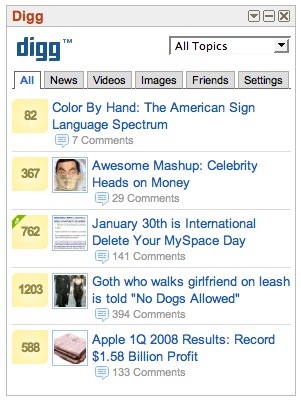 The Digg Google Gadget is the main way I stay up to date with Digg Top Stories, so the new functionality is great to see.